I popped into Le Boulanger one evening, thinking I would enjoy a quick sandwich before heading on my way. At the counter I simply ordered “the sausage sandwich,” thinking of the turkey & chicken pesto sausage sandwich that I have enjoyed in the past. Apparently that it was dark out wasn’t sufficient context to convey that I wasn’t interested in a breakfast sandwich, and so I received the Sausage & Egg you see above. I didn’t really have time to attempt an exchange so I took what I was given and went to eat. I’ll cut to the chase: This was a bad sandwich. I don’t write about a lot of the sandwiches that I don’t like, because I prefer On Sandwiches to be a celebration of things we love. That said, sometimes something just strikes me the wrong way and I can’t let it slide. This wasn’t any good. It goes beyond uninspired. 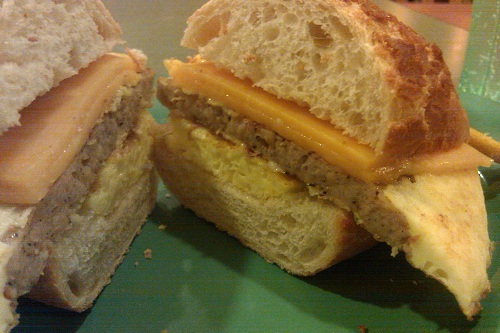 A few scrambled eggs, a breakfast sausage patty, some cheddar cheese. That kind of simplicity is one thing when I’m paying three or four dollars in a deli. But if I’m handing over a ten spot and barely getting enough back to buy a newspaper I expect a little bit more. The eggs were unobjectionable. If pressed to describe the sausage patty the best I might be able to come up with is “It’s a sausage patty.” The cheese quickly took on that oily sheen that makes you wonder why anyone bothers with any cheese, at all, ever. The dutch crunch roll was as good as dutch crunch often is, but it was all wrong. It would have been swell on the sandwich I thought I was ordering, but here it just didn’t fit. Between that and the aim-low-and-we-won’t-have-far-to-fall ambitions, there wasn’t anything redeeming here. A trio of uninspired ingredients somehow came together to be a good deal less than the sum of their parts. Enough. On Sandwiches is a celebration; I am an enthusiast, not a critic. There is no need to dwell here, there are great sandwiches out there, waiting to be eaten. This entry was posted in Sandwich Reviews and tagged Breakfast, Egg, Reviews by Pete, San Jose, Sandwiches Made For Me by Pete. Bookmark the permalink.